Even as I am sitting here writing this I am humbly thanking the Lord for His strength in helping me complete this project. This was a book that resonated deep in my heart and was written out of a love for those struggling with Lyme Disease and this journey of walking this difficult and painful path specifically during the holiday season. I started writing this book over two years ago ... writing on slips of paper, napkins, medication bags, pharmacy bags, magazine pages, etc... and in a variety of different places... in hospitals, doctors offices, the IV therapy sessions, detoxification protocols, hyperbaric oxygen chamber, etc. Finally after several months of writing out these reflections of my heart and precious Bible verses I combined everything into a book that is a heartbeat and passion of mine throughout this illness... When Light Dawns. 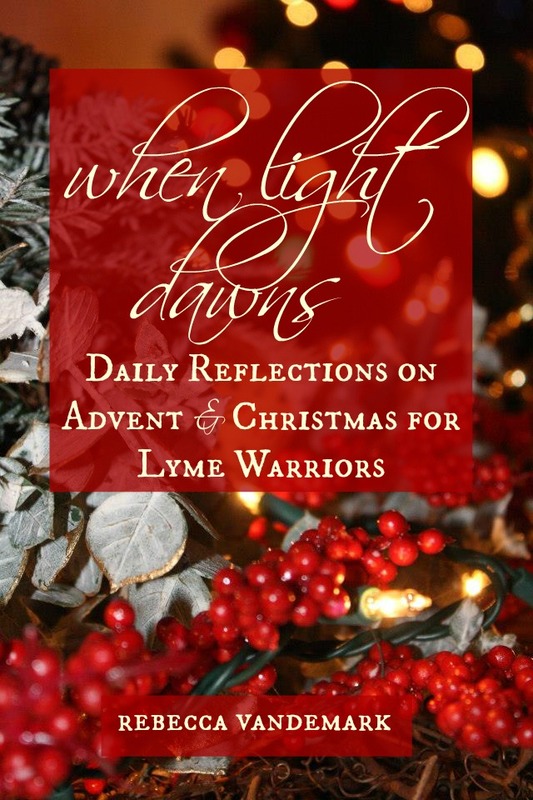 This 40 Advent and Christmas topic devotional is the first and only Lyme patient specific book for Advent and Christmas. When Light Dawns features daily reflections that will inspire, encourage, and give hope to Lyme Warriors. Containing a daily reflection for each day (from the last week of November through the first week of January) "When Light Dawns" can be used as a simple encouragement to the weary heart or as a guided devotional study. Either way, "When Light Dawns" will provide spiritual encouragement and give new meaning to the popular phrase "holiday preparations". Thank you to each of you that have already purchased it! !Thank you so much to ALL of you that have been walking this journey with me in prayer! TRULY you are a blessing!! You are amazing! Congrats on your book!